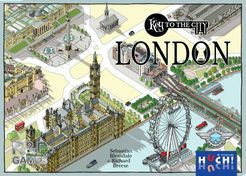 I bought the game ‘Key to the City – London’ about a month ago, and have been looking forward to giving it a run-out since. Val and Chris came around on Sunday, so this was a perfect opportunity. Unfortunately we had just got back from a break in Spain, during which time all my memory concerning rules and strategy had been wiped. Luckily the rules are fairly straight forward, but the strategies are not! Chris meanwhile had done some investigation online, so was ahead of the rest of us in his understanding. The game, essentially, revolves around getting iconic buildings into your borough, utilising them for resources and using these resources to upgrade the buildings for additional victory points. To do all these things you use meeples (or keyples), which come in 3 different colours. I think it took us 1 or 2 eras, before we got the hang of things by which time we realised that Chris was dominating the resource availability side of things. As a result, Chris was accumulating meeples in vast numbers, allowing him to dominate the bidding and upgrades in the latter eras, especially the final bidding for Routemaster tiles which generate bonus points. By the game end, it was clear to all who had won! Chris had 137 points, followed by Val (86), then me (62) and Elaine (43). We all enjoyed the game, and picked up the rules quickly. The artwork on the tiles is excellent. Placing ‘connectors’ can be a bit fiddly but was not a major problem. Where to put these connectors and acquired buildings is important, and this was the issue that really scuppered Elaine’s chances. Another key decision point is when to pass and when to set sail and get out of the era. We also now know not to let a player dominate resource tiles; you just end up paying him, boosting his meeple collection. Next time I’m sure we will all be a bit more savy in our game play. We finished the session with a quick game of Carcassonne, which I duly won. As a side note, today Snowydog had a haircut, which meant I had an hour or two in town. I looked in the Dogs Trust charity shop and found 3 Reiner Knizia games (Strozzi, Palazzo, Zombiegedden) for sale, and picked them all up for £20 total. The zombie game is not my thing, but as it was cheap (and for charity) so I bought it anyway. I also re-acquired Forbidden Island for only £2 from another charity shop! It clearly pays to keep an eye out for such bargains.